Das Feuerwerkbuch ist eines der ältesten wenn nicht sogar das älteste deutschsprachige Buch mit technischem Inhalt. Es enthält detaillierte Informa-tionen zur Pulverbereitung, zum Laden der Steinbüchse und zum Schießen damit nach dem Stand der Technik vom Beginn des 15. Jahrhunderts. 2) die synoptische Darstellung zweier Texte des Feuerwerkbuches mit vielen erklärenden Anmerkungen FWB_SYNO.pdf, geschrieben mit modernen Lettern. Around 1250 gunpowder (Schießpulver) appeared in Europe, coming from China via the silk-road. Gunpowder, an explosive mixture of saltpetre, sulphur and charcoal, was soon followed by the first weapons using gunpowder as a propellant for various kinds of projectiles, i. e. firearms (Feuerwaffen) came to Europe too. In the following hundred years firearms spread over Europe gaining more and more influence on warfare and in the outgoing 14th century became quite standard on every theatre of war. 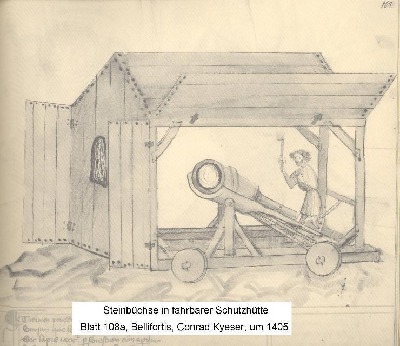 The gun throwing large stone-balls, in German called Steinbüchse, revolutionized fighting for towns and castles and made the medieval town-walls more or less obsolete within a few years. Hand in hand with the developing of gunnery a new profession appeared: the gunner, often called master-gunner corresponding to the German word Büchsenmeister. In the early days of gunning the master-gunner had to know all about guns, even the making of guns was his duty, but around 1400 the main tasks of a gunner were reduced to preparing the ammunition, loading and shooting the gun. Making the guns had taken over the gun-founder and the gun-smith. But what meant “preparing the ammunition” around 1400? It clearly meant more than to be expected in our days. First, the gunner had to acquire saltpetre – buying it from tradesmen who imported the saltpetre mostly via Venice, or collecting it in stables, or producing it in so called “saltpetre gardens” or “saltpetre plants”. Second, he had to clean it from different soils or admixtures with the aim of getting pure saltpetre, as pure as possible. Third, he had to acquire the right charcoal und sulphur. As soon as those three substances were on hand, the gunner could start grinding and mixing them to make the powder. To make good powder the gunner had to know the best relation between those three ingredients of gunpowder and what powder to use in what gun. Further he had to know the best way of mixing the three components and how to keep and store the powder. Add the knowledge about loading and firing – at the moment skipping all details - and a few smaller items like preparing “fire-balls” or fuses and you have roundabout what a successful master-gunner was expected to know. Here and then, i. e. in the first years of the 15th century, an unknown author started to compile what was later known as the Feuerwerkbuch, a name given to his work by the unknown author. In this book one can find in detail and in systematic order all the knowledge a master-gunner in the beginning 15th century had to have. That systematic order made it possible to use the Feuerwerkbuch as a handbook for the experienced master-gunner as well as a step-by-step tutoring aid for the newcomer-gunner in training and learning. Since, of course, the unknown author knew what he was writing about, we might assume that at least the author - and first writer too? - of the Feuerwerkbuch was a master-gunner who wrote this way the very first book about technology in German language, based on his personal experience and knowledge.. The book is written in early New-High-German language (Früh-Neu-Hochdeutsch), so the author is unquestionable German, and considering some details in the language he used his native country probably was the southern part of the then Deutsches Reich, i. .e.. Bavaria-Austria-Tyrolia. Soon after the book was finished copying started and continued until in 1529 the printing began. Though the very first manuscript seems lost dozens of manuscripts and numerous prints survived in different libraries. Four manuscripts, dated 1432 and later, and two prints, dated 1529, were compared – chapter by chapter, word by word, with the result that, setting aside some minor differences, the six texts were nearly identical. The table of contents in the file FWB_Inh.pdf shows better than many words that copying was done very carefully over ca. 125 years!. In the downloadable file FWB_SYNO.pdf is included a transcription with modern letters of the Freiburg manuscript (1432) and the Augsburg printing (1529), the necessary introduction is contained in FWB_Vor.pdf. The necessary explanations one needs to understand the old-fashioned text can be found in the ca. 275 notes (in FWB_SYNO.pdf). To make the access to the Feuerwerkbuch still easier there follows in FWB-Neu.pdf a translation oft the complete text into modern German, based on the abovementioned texts after filling in omissions, after setting right scribe’s and printers errors by comparing four different manuscripts and two different prints. This way here is presented for the first time a reliable corrected old text of the Feuerwerkbuch and a therefore complete and reliable translation too. The first picture shows a typical gun of around 1400 in a shelter. One can see the large-diameter barrel for the stone and the small-diameter chamber for the powder (Bellifortis, Conrad Kyeser, 1405). The second picture shows a gunner kneeling behind his gun, also a typical stone throwing one. 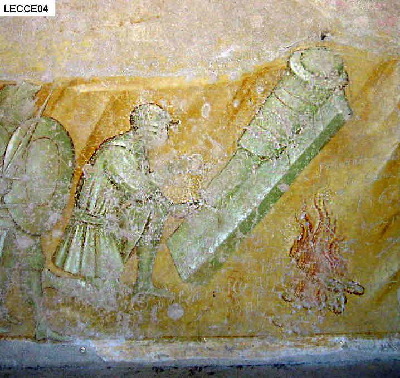 (Fresco in the monastery Eremo Lecceto west of Siena, Italy, ca. 1425). Note that the gunner in the first picture is igniting his gun with a burning slow-match or something alike, whereas the second gunner has a fire on hand to heat the iron rod (German: Loseisen) used for igniting prior to the slow-match.